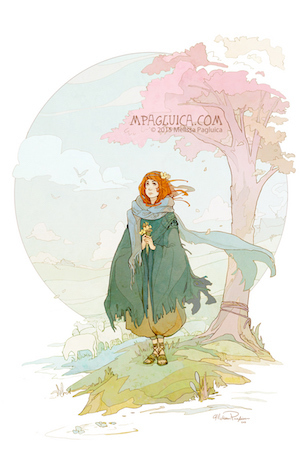 Melissa Pagluica is a freelance artist living in San Francisco and is the creator of the comic book Above the Clouds. You can find her work at mpagluica.com. She provided art for this month's two-part story, "Gorse Daughter, Sparrow Son," by Alena Indigo Anne Sullivan. This interview was conducted by email in August 2016. Melissa Pagluica: Drawing every day. Even as a kid, I was always trying to create worlds and stories with my art. In 2007, I graduated with a BFA in intermedia studio (meaning, I experimented in different areas—such as sculpting and printmaking—as well as illustration). After graduating I found a day job while doing anime and comic conventions on the side. Slowly, after eight years, I was able to kick the day job and do art full time! It was definitely a journey to get here. 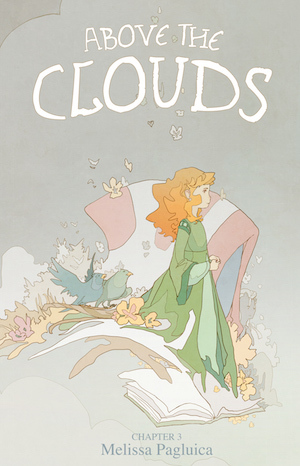 Tory Hoke: You launched a Patreon for your fantasy webcomic, Above the Clouds. Tell us a little about it. What inspired you to create ATC? What are your dreams for it? Melissa Pagluica: Thank you so much for asking about Above the Clouds! It has been my passion project for the past four years. It started while I still had my day job; I was only able to dedicate half my time to it in the beginning. It’s thanks to ATC that I am able to do what I love all the time. Above the Clouds is a half silent comic that intertwines two stories: one about a hero trying to save a dying world, one about an author who needs to finish what he started. It is mainly seen through the eyes of a young girl named Eily, a creative herself who really wants to know how the author’s story ends. At the heart of the ATC is a tale about not giving up. We all must fight for our dreams—for what makes us happy. That’s why ATC was started in the first place. It really did start as a project to learn how to tell a story through sequential art, but it took on a life of its own. The story I started with on those first two pages evolved and became quite a different story by the time Chapter Two started. When the eight chapters are done, I daydream about collecting them in a beautiful hardbound book. It really is thanks to my patrons and the people who have supported ATC at conventions that I have been able to push the story this far. © 2015 Melissa Pagluica, "Waiting"
Tory Hoke: You work in sculpture as well. How do you compare sculpture with illustration? Melissa Pagluica: It’s a different way of looking at storytelling. Every form and shape informs the viewer on how they should feel about what they are looking at. I absolutely love sculpting and wish I had access to a kiln, so when I graduated college I became interested in projects I could do at home, using oven baked clays like Sculpty and Premo. I made a doll sculpture named Tulah who even has her own backstory! You have to think about the form from all angles, but when it slowly starts coming together, it's an amazing feeling. My mind seems to gravitate toward giving my work stories and because of this, it’s what informs my decisions about how things should come together (that’s how it works with my illustrations too)! 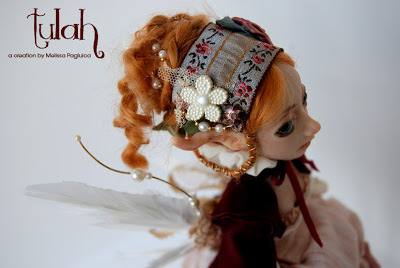 Above the Clouds takes up a lot of my time, but I would love to return to creating more art doll sculptures. It’s fun being able to feel the clay in my hands and stretch my other skills (such as sewing). © 2015 Melissa Pagluica, "Tulah"
Tory Hoke: Your compositions, colors, and delicate line work evoke sort of a modern Art Nouveau. How did you develop this style? What other artists inspire or interest you? Melissa Pagluica: I am a quiet person and I think my color palettes tend to reflect this. 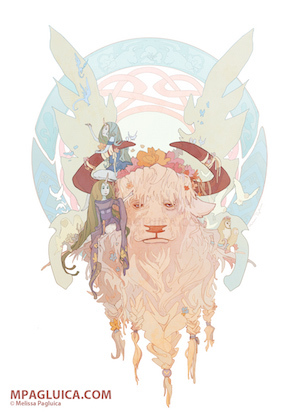 Line has always been so seductive to me and I would always gravitate towards illustrations that I would see in books and cartoons, which is why I love the greats, such as Mucha, French posters from the late 19th century, studios such as Ghibli who take the time to craft their stories, and game artists such as Amano. And I can’t forget John Waterhouse! You become instantly transported to other worlds just looking at their work. Melissa Pagluica: Because of conventions, I find that I am always on the road. But I feel I’ve found an amazing community within the comic book convention scene. We are always crossing paths. People start to become familiar faces. They are incredibly supportive, and it’s amazing how giving they are because we all want to see each other succeed: people like Travis Hanson, creator of The Bean; Lucas Elliott, who lives all the way in Alaska; Diana Levin, and so many more. I often joke about my friends living far away in different cities. But I am so happy our paths have crossed because of comics. Back at home, I also volunteer at the Cartoon Art Museum. I wanted to find a way to get involved in the San Francisco community, and it’s been an amazing experience to have a chance to be part of some of the work they do. These are some of the most passionate people who love their work. Melissa Pagluica: More of? Oh man, I already feel overwhelmed with what everyone is creating. Melissa Pagluica: I’m working on my dream project! As it’s my first story, my hope is that I can keep learning and becoming a better storyteller. So I guess the next dream project would be working on a story without having to do a crazy amount of traveling. Also a story that pushes me to learn something new about making people fall in love with my characters. 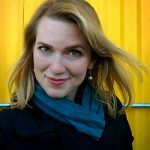 Melissa Pagluica: The dozens of stories I've been writing on the side. Every time I finish a project, I take a look at where I am and where I was before starting. I have to ask myself the big question: "What kind of artist do you want to be? What am I doing to get closer to that?" It’s what guides my choices. Tory Hoke: Thank you for your time, Melissa! It's been a pleasure. Melissa Pagluica: Thank you, Strange Horizons, for taking the time interview me. I am really excited to do an illustration for one of your stories.